Back in 2015, a couple of Intel’s employees that were working on drone projects were wondering whether or not it is feasible to fly 100 drones over Intel’s headquarters. The drones would create the company’s logo through the use of lights and colors. Intel’s drones are lighter than your commercial drone examples but are very maneuverable. They’re called the Intel Shooting Star Drones and have 4 propellers that are encased in plastic. The drones also have a center made out of styrofoam and a special type of LED light (flashing) on the bottom part of the drone. This LED light can display a staggering four billion colors! Here’s another interesting piece of info: Only a couple of people were behind this light show! That’s right, there weren’t huge numbers of pilots operating each drone; it was all pre-programmed by Natalie Cheung and her engineer team. The drones themselves are made just for entertainment purposes and that’s partly what makes them so interesting. 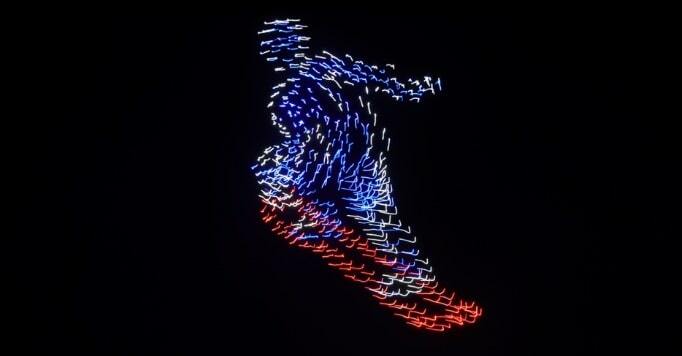 During the light show, we could see many different shapes and objects, all created by the choreographed drones. The show went on for around 8 minutes and many onlookers decided that this was how they’d spend their night. And they didn’t make a mistake! 3D objects like a globe of the world that was rotating around its axis and a dance party were on display. The scenes were absolutely beautiful and enjoyable. Natalie Cheung is extremely proud of the achievements of her team and has said that these drones and light shows are evidence of how quickly technology can advance. It’s also evidence of how the human mind works; Cheung and her team were telling a story through small balls of lights. It’s also worth noting that, because the drones are small and light, caution must be used when planning. Any wind stronger than 15mph (and sometimes even less) is enough to cause safety concerns. This is why Cheung and her team is completely dedicated to their jobs and hobbies – flying drones and giving the people of the world something to enjoy. It is safe to say that after all of these displays of engineering marvel and creativity, Natalie Cheung has achieved what her team first thought of a couple of years back. Plus, there is a big benefit to what they are doing – the ability to fly multiple drones at the same time.